One of our many Charitable Efforts & Causes here at Peace Frogs, the 10th Annual Peace Frogs Bank-to-Bank Swim is set for May 25 at 10:30 a.m., with registration now open to individuals and teams. "In the eight years we have held the event, we have raised over $140,000 for children's charities," said Peace Frogs founder and president, Catesby Jones. The funds have supported groups including, among others, the Gloucester Boys and Girls Club and Rural Infant Services Program. Without the participation of philanthropic minded swimmers, Jones said, "we could have never done this." The Bank-to-Bank swim crosses the York River, starting at Felgates Creek along Virginia's Colonial Parkway near Williamsburg, and ending at a private residence in Gloucester County, tucked between Carter and Cedar Busk Creek. The three-mile swim is not a race. 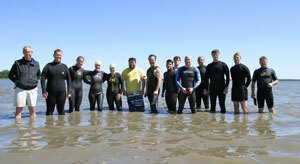 "It is a charity swim," Jones said. "To participate, a swimmer must raise at least $1,000 in donations for the Peace Frogs Bank-to-Bank Fund." The fund is administered by the Gloucester Community Foundation, an affiliate of The Community Foundation Serving Richmond and Central Virginia. The fund is designated to support children of the Tidewater, Va. region. Interested swimmers can register by contacting Jones via email at info@peacefrogs.com. "If you can't swim, or you know someone who may be able to swim, please put them in touch with me," Jones said. Teams are permitted to register to share the swimming distance as well as fundraising requirements. "It is cold here in Gloucester, but I am starting to get into the pool and prepare for this year's swim," Jones said. "It is a great time, and I am looking forward to swimming with you all."